Jefferson's winding walk and the accompanying flower border were laid out in the spring of 1808. A sketch of his design also included four large oval-shaped areas that were to be planted with flowering shrubs; however, it is not known if these were ever installed. By 1812, Jefferson needed a more systematic organization of the border and so divided the beds into ten-foot sections, each compartment numbered and planted with a different flower. 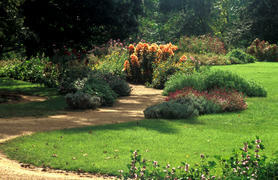 The winding walk and border is not a traditional "garden," which usually suggests a room outside, an enclosed retreat. Jefferson's flower beds and borders are exposed to the elements, open to the central Virginia landscape, intimately balanced with what he called "the workhouse of nature . . . clouds, hail, rain, thunder, all fabricated at our feet." The winding, relaxed lines of the walkway reflect Jefferson's interest in the latest, informal style of landscape design, which he had admired during his visit to English gardens in 1786.